This gorgeous home is great for families and groups and is just steps away from a large, private beach. Anchor Point is both lovely and luxurious. 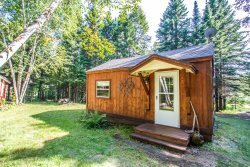 Looking out over 200 feet of Lake Superior shoreline in Tofte, it has something for everyone and is a truly unique property. You will love this spacious home that features a large game room, theater, two balconies, a large lake-facing deck, and every bedroom has its own private bathroom. Anchor Point is a 3-story private home with 5 bedrooms and 5.5 bathrooms. On the main level you will find a living room with vaulted ceilings and large windows that allow you to enjoy the sweeping views of Lake Superior. The double-sided gas fireplace leads into the dining room and kitchen area. The kitchen has stainless steel appliances, granite countertops, and a gas stove (a hard find on the North Shore!). The main level has two bedrooms, including the master bathroom that has a jetted tub, gas fireplace, and private balcony. In the upper level there are two more bedrooms and two more bathrooms, as well as a game area and private balcony. In the lower level you will find an escape perfect for children. The bedroom features two sets of bunk beds, a chalkboard, and a bathroom designed for kids- including a lower toilet and sink. The lower level boasts the game room with a foosball and pool table, and the home's movie theater. The home's lake-facing deck is complete with tables to enjoy a meal, chairs to relax on (seasonal), and, of course, great Lake Superior views. Step down to the private shoreline area that features 200 feet of Lake Superior ledge rock. The town of Tofte is a great home base for many North Shore adventures. In the summer months, you are just a short drive away from miles of hiking and biking trails, including the Gitchi Gami bike trail and Temperance River State Park. In addition, you are just 10 minutes from the Superior National at Lutsen Golf Course. Head inland to the Carlton Peak area in the fall to take in the beauty of leaf change season on the North Shore. In the winter months, you are just a 10-mile drive from the Lutsen Mountains Ski Area (also a great summer destination with an alpine slide and sightseeing gondola) and have easy access to miles of snowmobile trails. In the spring, a short drive to any of the area state parks will bring you to amazing waterfalls that truly come to life during the "waterfall season". Looking for more adventures? Visit Sawtooth Outfitters for ideas of where to go, what to do, and to rent the gear you need to do it- you're within walking distance, just take Tofte Park Road! If you are craving a bite to eat take a short stroll to the Bluefin Grill or CoHo Cafe. Many other dining options are just a short drive up the shore in Lutsen. Take a day trip up to Grand Marais, 30 miles up the shore, for a day of shopping and dining at this quaint lakeside town. Anchor Point is perfect for large families, family reunions, and groups of friends who all want to enjoy their own space. Book today and make Anchor Point your North Shore Home Away From Home! Lake Views from Living Room, Dining Room, Master Bedroom, and Game Room. Close to State Parks and Superior National Forest Hiking Trails.